Project partners from across the Interreg 2Seas Region are working together within the USAR (Using Sediment As a Resource) project to develop an improved approach to the management of dredged sediments and in particular, greater reuse of this potentially valuable resource. The USAR project comprises of several work-packages including the development of a regional sediment recycling strategy, an online tool to assist sediment managers in finding ways of reusing recovered sediment and three pilots of novel sediment reuse methods. Sedimentation of ports and harbours and the ecological damage caused by soil loss/erosion are two sides of the same problem. With better soil management and small-scale measures to locally trap sediment we will keep more soil on our fields and out of our rivers. This will be good for farmers, fish and port and harbour authorities. Changes in land use (more intensive agriculture, often at the expense of natural forests) and changing weather patterns (more intense rainfall events) mean that soil erosion and sedimentation of estuaries and ports is an increasing problem across the world. 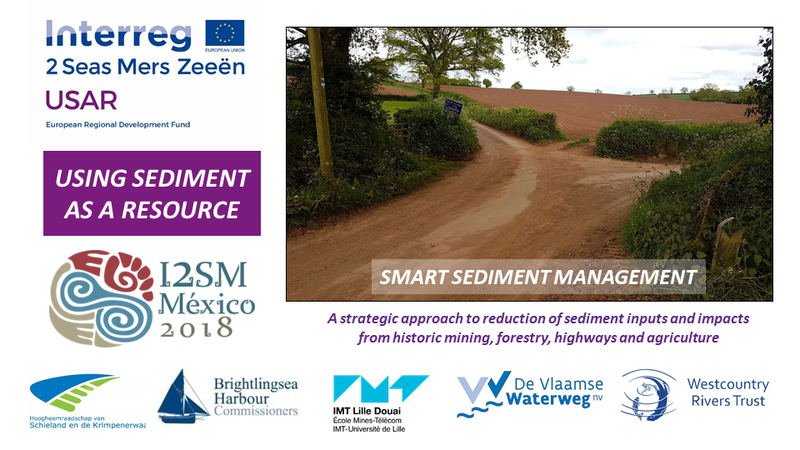 The International Symposium for Sediment Management (I2SM) is held every two years as an opportunity for sediment practitioners and researchers gather and share ideas and new developments on how best to address these problems. In 2018 the 6th I2SM was held in San Cristobal de las Casas in the Chiapas region of southern Mexico. Presentations from three partners were accepted by the scientific committee and so along with Hans and Guido from the Belgian and Dutch partners, Simon (WRT senior Evidence & Engagement officer) set off for Mexico to talk about the work of the Westcountry Rivers Trust. Simon’s presentation was entitled ‘Smart Sediment Management: A strategic approach to reduction of sediment impacts from historic mining, forestry, highways and agriculture’. From the very beginning of the conference, it was clear that soil erosion is a massive problem in the steep landscape and semi-arid climate of Mexico. We were told in the opening addresses that ‘the best soil of Chiapas is in Tabasco’!